First the whisky: Bruichladdich has made two in a way pointless press releases yesterday and today. Why ‘in a way pointless’? Because you can't actually buy either of the two whiskies they've just released any more, they both sold out before they were even released. 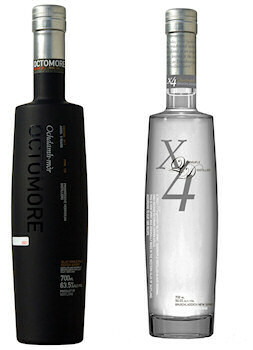 They are the Octomore (at 131 ppm not to be confused with the Octomore Futures (tasting video) which ‘only’ has 80.5 ppm) and the X4 Islay Spirit, originally quadruple distilled to 90% ABV. Ron is expecting his bottle of Octomore by Christmas while Tom Morton recommends not to drink it too quickly. What I don't fully understand is the part about the ‘three times more peaty’ though: If you consider the Octomore Futures to be a different whisky to this Octomore, why/how is 131 ppm three times as peaty as 80.5 ppm? 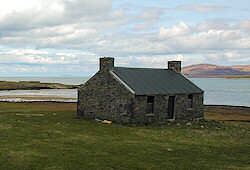 OK, on to the birds: Two species Islay is well known for at Corncrakes and Chough. The news are not so good as far as the Corncrake is concerned, at least after a first glance at the headlines like Corncrake numbers 'show decline' and Corncrakes Population Falls By 8 For First Time In A Decade. However, reading the RSPB press release about the Corncrake numbers a slightly different picture emerges. The decline is for the numbers across Scotland, while on the Hebridean and Argyll islands the Corncrake has found strongholds. This includes obviously Islay, Colonsay and Oronsay which have (if I'm not mistaken) steady numbers of Corncrakes calling. Jane Reid, a scientist at Aberdeen University has won the £70,000 Philip Leverhulme Prize for her research at ‘how genetics and the environment affect starlings on Fair Isle and red-billed choughs on Islay.’ For further links and quotes from a press release see Chough Research on Islay Pays Off on Ron's blog.